NAJ; NA; OA; RN; RA; CD; RE; OAJ; CGC; FN; TN-N; WV-N; O-WV-N; NAC; TG-N; NCC; TN-O; WV-O; O-NAC; NJC; O-NCC; TG-O;S-NAC; OAC; O-NJC; O-TN-O; O-WV-O; CL3-F and most recently NTD (Novice Trick Dog!!) that should be 30!!!!!!! OTCH MACH-7, IABCA Int'l/Nat'l Champion, UDX, AAD, EAC, EGC, EJC, NTC. Cider was High in Trial at the USASA Nationals in 2004 out of Novice B. and High in Trial as she finished her OTCH in 2004. She has also starred in a TV commerical for West Central Cellular. She has many more agility titles not listed here. Gottabe's Twice in A Blue Moon, "Moon"
Moon's agility acccomplishments are: Versatility NATCH Gottabe's Twice In A Blue Moon, OA, AXJ, Vers-N, Vers-O, S-WV-E, CL. Conformation Championships: MASCA, NAKC Amer./Can., IABCA Nat'l/Int. MASCA, IABCA Nat'l/Int'l/ NAKC-Amer/Can. conformation championships. #10 MASCA dog in 2005. MASC, IABCA Nat'l/Int'l/NAKC-Amer/Can. conformation championships. Mult. BISS, BIS, MASCA & UKC, ARBA, ABCA Nat'l/Int., IABCA Nat'l/Int., Rarities conformation championships. He also received Reserve Winner's Dog at NAMASCUSA nationals (2001), Best in Specialty Show at the MASCA Nationals (2003), #3 MASCA in 2003, and #10 ARBA in 2003, Award of Merit, MASCA Nationals, 2004. At just a year of age, Barons has earned his MASCA/NAMASCUSA/Nat'l & Int. Jr/ and NAKC conformation Championships! He has received several BIS & has just finished his MASCUSA GR CH & AKC Certificate of Merit. At 7.5 months of age, Stella (Baron's sister) has earned her MASCA/NAMASCUSA/Nat'l & Int. Jr/ and NAKC Jr. conformation Championships! Mult BIS, MASCA Grand, NAMASCUSA Grand, IABCA Nat'l & Int., and NAKC conformation Championships. Gottabe's Its All About Me! Diva is an aussie, not a mini. She has earned her UKC, IABCA Nat'l & Int., and NAKC conformation championships. 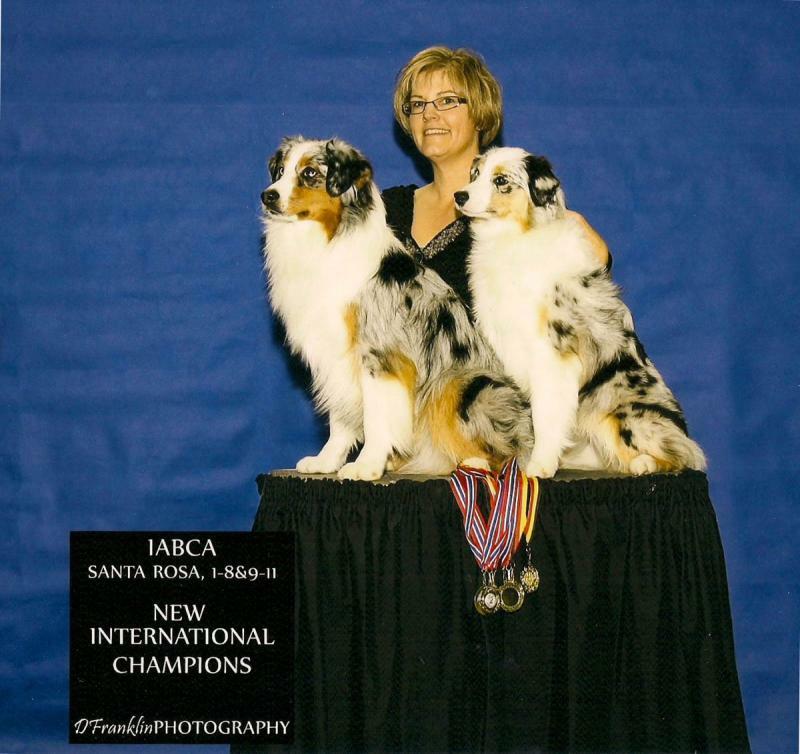 Gottabe Blackbriar On The Spot, "ChaCha"
Jr. Int'l Ch, NAKC Jr. conformation championships. MASCA/NAMASCUSA/UKC championships. Unfortunately, Simon was placed by Fairplay Mini aussies and we no longer know where he is. 3rd generation Gottabe - Mult. Ch. Passion's Gottabe Darkfever Jerico "Barons" & Newly championed MASCA/NAMASCUSA/JR. Int./Nat'l/NAKC Jr. CH. Gottabe's I'm A Fool for You, "Ava" with several group, and Best in Show wins at the IABCA January show in Santa Rosa, CA. Many of the titles are agility titles - and encompass many agility venues. What does it mean to have an International or National CH? The International All breed Canine Association is one venue in which minis can compete. IABCA does things a little different - they 1st judge the dog against the standard of the breed, then 2nd judge the dogs in the class. Although a dog may receive passing marks against his breed type, it may never place 1st in its class, nor win against other minis, yet still be awarded Int/Nat'l titles. When you see this title, ask the breeder if the dog won its class, breed, and placed in the group and possibly Best In Show. The certificates given at the show will have Best of Breed stickers attached.